Home / News / Showbiz / Viral / Maris Racal, Pinag-usapan Ngayon Matapos Itong Mapansin Ng Mga Netizens. Maris Racal, Pinag-usapan Ngayon Matapos Itong Mapansin Ng Mga Netizens. Former Pinoy Big Brother housemate Maris Racal is now on the verge of her stardom. After becoming the second big placer from the reality game show, Maris has appeared in a lot of television shows like “Gandang Gabi, Vice!,” “Ipaglaban Mo!,” “Maalala Mo Kaya,”It’s Showtime.” She also starred in movies like “The Breakup Playlist” (2015) alongside Piolo Pascual, Sarah Geronimo, and Diego Loyzaga as well as “Vince and Kath and James” (2016) with Julia Barretto, Joshua Garcia, and Ronnie Alonte. Just recently, she was casted in the horror film “Bloody Crayons” (2017) together with Janella Salvador, Elmo Magalona, and Jane Oineza. With a very talented artist like Maris Racal who can sing, and act, a lot of companies are crowding all over her and giving her only the best project offers to further boost her career. Just recently, the young actress posted on her social media account a few pictures from the behind the scenes photoshoot for Vivo Mobile Phones, which she is now an endorser of. Being an elegant looking lady, Maris showed how simple yet pretty she was as she looked away from the camera. On the second photo, visible in her eyes was the look of fierceness. 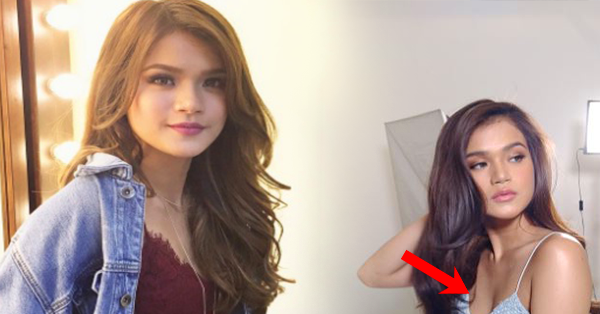 Watch the video below to see how glamorous Maris looked like during the photoshoot! Vivo is a Chinese mobile phone company that has been taking both the local and international market by storm recently. The smartphone brand currently targets the younger generation by creating affordable phones which can produce high-quality photos. What can you say about Maris Racal being an endorser for Vivo? Don’t you find her one very talented young lady? Tell us your thoughts in the comments section below!